Scrolling through QNAP's extensive listing of NASes, you can find a product to meet just about any need. Our more recent QNAP reviews have included "SMB" class products, including the high-end TVS-471Turbo NAS and mid-class TVS-463 Golden Cloud Turbo NAS. This review will focus on the TS-563-8G Turbo NAS. As QNAP's only 5-bay NAS and AMD-powered, it's a unique box. The TS-563-8G is the 8 GB SKU; it's also available with just 2 GB of RAM (TS-563-2G). Both models have a single PCI-E expansion port and five USB 3.0 ports, but lack a front panel LCD screen, HDMI port and locking disk trays. The chart below compares the TS-563 with two other NASes I'll be comparing it to. All three of these NASes have at least one PCI-E slot and support optional 10 GbE NICs. So we've tested all three using both our standard Gigabit and optional 10GbE connections. Since the cost of the 10 GbE adapter adds significantly to the total cost of the NAS, we will be doing separate Gigabit and 10GbE competitive comparisons. I've chosen a slightly different mix of products to compare using our standard single client Gigabit tests: the ASUSTOR AS7004T and QNAP TVS-463 Golden Cloud Turbo NAS. The callouts below show the front and rear panels of the TS-563-8G. There's a single USB 3.0 port on the front panel located just below the One Touch Copy button. The rear panel has two Gigabit Ethernet ports and four USB 3.0 ports. Like some other QNAP NASes, the TS-563 proved to be difficult to disassemble, so I don't have a PCB photo. The photo below shows an inside shot showing the optional 10 GbE NIC installed. The table below summarizes the key components for the four NASes we'll be using for our comparisons in the performance section of this review. Power consumption with four SmallNetBuilder-provided WD Red 3TB (WD30EFRX) drives was 51 W (active) and 40 W power save. RAID 5 and RAID 10 rebuild times were each 2 hours and 55 minutes. Fan and drive noise was rated as Medium Low (mostly drive noise). There was a fan spin up to high during the RAID 10 format due to high temperature on drive 3. 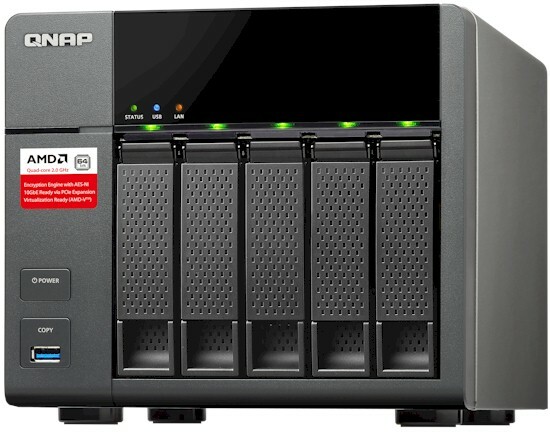 Like all QNAP NASes, the TS-563-8G runs QNAP's QTS NAS OS. Recently, QNAP released an updated version, QTS 4.2. New features include a revamped user interface, updated multimedia features, optimized storage management and backup and data protection with 2-step verification. You can download a brochure detailing the features of QTS 4.2 here. If you'd like to experience many of the new features of QTS 4.2, you can try out their live demo. A quick start tutorial shows you how to create and manage data snapshots, back up documents and files using Time Machine and third party backup software, use Qsync to synchronize files on multiple devices and add apps through the App Center. The screen hot below shows the landing page of QTS 4.2 with the Quick Start tutorial. One nice features of QTS 4.2 is multiple window support. Tabs across the top of the screen help you quickly switch between windows. The gallery below has some additional screenshots from QTS 4.2. Back up your documents and files.